SEOUL, Nov. 10 (Yonhap) -- Major League Baseball (MLB) has tendered status checks on two South Korean free agent pitchers, officials here said Thursday, as big league clubs have begun taking formal steps required to sign players based here. 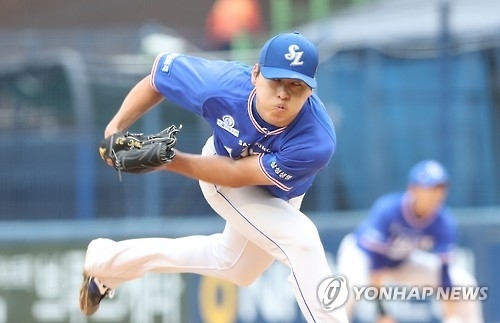 The Korea Baseball Organization (KBO) said MLB inquired about the status of two All-Star left-handers, Kim Kwang-hyun and Cha Woo-chan, on Tuesday. The KBO informed its counterpart that both pitchers are free agents and are eligible to sign with any club, domestic or foreign, starting Friday. Earlier Thursday, the KBO released the list of 15 free agents. Under an agreement between MLB and the KBO, a major league team interested in a South Korean player must go through the status check through the league offices. Kim, 28, has been pitching for the SK Wyverns since 2007 and has been one of the KBO's premier left-handers. He was voted the league MVP in 2008 and has been a mainstay on the national team at the Olympics, the Asian Games and the World Baseball Classic. Kim was posted after the 2014 season and entered contract talks with the San Diego Padres. After their negotiations broke down, Kim returned to the Wyverns and pitched two more seasons before becoming an unrestricted free agent. Kim was 11-8 with a 3.88 ERA this year but was limited to 137 innings with elbow problems. He is 108-63 with a 3.41 ERA in his 10-year career. Cha, 29, has been with the Samsung Lions since his debut in 2006. Though his counting stats aren't overly impressive -- 70-48 with a 4.44 ERA -- Cha has been one of the KBO's most versatile pitchers. He has split his career in the rotation and the bullpen. He picked up 21 holds out of the pen in 2014 and returned to the rotation in 2015 to lead the league in strikeouts with 194 in 173 innings. This year, Cha went 12-6 with a 4.73 ERA in 24 appearances. Cha hired a Japanese agent in April, with an eye on the Nippon Professional Baseball there. Among other free agents, All-Star third baseman Hwang Jae-gyun has also attracted interest from major league clubs. He's scheduled to hold a showcase before major league scouts in Florida on Nov. 21. Left-hander Yang Hyeon-jong, former ERA champion, is also a free agent. He remains undecided on whether he'll stay put at home or knock on the big league doors again. Both Hwang and Yang were previously posted for major league clubs. Hwang didn't draw any bids, but Yang's KBO club, the Kia Tigers, declined to accept the winning bid for the pitcher.